People like to think that the cliques of high school end with high school, but they don’t! This is all too evident when six adults who “have their lives together” must cooperate on a life changing opportunity. Hook, a dating app, is going public and all of their careers hang in the balance. Their stories merge with romance and murder, all with the essence of high school popularity. 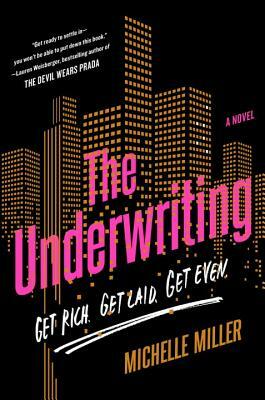 Michelle Miller’s The Underwriting is a fast paced story that gives you a glimpse of a (not so) glamorous corporate world. A suspenseful, racy, and achingly honest story of the entangled lives of six young women and men as they take Silicon Valley's hottest dating app public. Tara Taylor runs six miles every morning, never eats after nine p.m., is the first to arrive and last to leave the office, but is starting to wonder why she bothers. When her old Stanford flame, Todd Kent, asks her to join his four-person team handling Hook's IPO, the deal of the decade, she sees her opportunity to break through the glass ceiling and justify six boyfriendless years of sacrifices for her career. And the $14 billion dating app might have more in store for her than a bigger bonus. But that kind of money changes people. When the deal is thrown into a tailspin, Tara and five others will each find out just what they re willing to give up love, family, integrity to get to the top. Michelle Miller worked at J.P. Morgan Private Bank and as a consultant in Palo Alto, New York and Europe before leaving to pen The Underwriting. Her writing has appeared in The Huffington Post, Medium, Town & Country, and Redbook. She holds a BA and an MBA from Stanford University, and currently splits her time between New York and her hometown of Asheville, North Carolina.